Tokyo, January 5, 2012 — Fujitsu today announced the Japan availability of its new ARROWS ES IS12F smartphone, manufactured by Fujitsu Toshiba Mobile Communications. The new smartphone will be available in a steady roll out starting January 7, 2012 from KDDI Corporation and Okinawa Cellular Telephone Company. Measuring just 6.7mm thick and weighing a mere 105g, ARROWS ES IS12F pushes the limits of slim handset design as one of the world's thinnest smartphones, while at the same time incorporating water-resistant technology. The smartphone employs a hybrid construction that brings together Fujitsu's latest slim-profile technologies, as well as super strong and rigid Corning® Gorilla® Glass and a scratch-resistant "Ultra Toughguard" coating. The result is a handset that is thin and light while also robust and that can be used in a variety of situations. Smartphones continue to feature a wide range of new advanced capabilities, but there is still a need for mobile phones to be light, thin, and easy-to-carry. The ultra-slim and sophisticated water-resistant smartphone incorporates a wide range of advanced features, including a new AMOLED(1) display that stands out for unparalleled clarity. The new 4.0-inch AMOLED display boasts higher contrast and clarity, as well as improved response times and tracking compared to conventional LCD displays. With Fujitsu's latest high-definition technology, users can enjoy fluid high-resolution video content. The smartphone's high-performance 1.4GHz CPU and quick-response touchscreen also make for a smooth and effortless user experience. The ultra-slim ARROWS ES IS12F incorporates a host of standard features, such as one-segment broadcasts, mobile wallet (Osaifu Keitai), and infrared communications, as well as cutting-edge capabilities including IPX5/8 water-resistant technology(2), a 5.11 megapixel camera that can capture Hi-Vision videos, and Fujitsu's original human-centric engine that delivers intuitive ease-of-use. 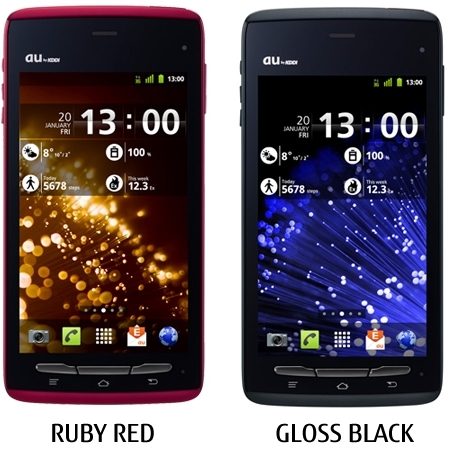 IS12F is available in two colors: RUBY RED and GLOSS BLACK. To achieve a slim form factor, Fujitsu has employed a hybrid stainless metal construction that has been optimized to fit the shape of the handset. Even at 6.7mm, users can be reassured by the smartphone's durability. IS12F employs specially reinforced ultra-strong and rigid glass that protects the phone from scratches and shocks during daily use. The advanced glass, while beautiful to look at, also provides superior functionality. IS12F utilizes a chip-resistant and scratch-resistant coating. As the coating is more wear-resistant than regular paint, the handset can be used for a long period of time while preserving its stylish exterior. The smartphone's 4.0-inch AMOLED display renders color in clear and stunning tones. The new screen can display approximately 100 times the contrast, as well as achieving roughly 100 times the response time and tracking speed, of conventional LCD displays. In addition, by improving the display's light transmittance and reflectivity, it is easier to view even in direct sunlight. With Fujitsu's latest high-definition technology, users can also enjoy smooth high-resolution video content that has been optimized for the AMOLED display, with unparalleled clarity. The phone is equipped with Qualcomm®'s MSM8655 (1.4GHz) Snapdragon® mobile processor, which enables users to easily take advantage of touchscreen operations, browse the web, and use applications. The CPU's high processing performance delivers an easy-to-use operating environment. The phone enables effortless and smooth touch operations through its quick-response touchscreen. This, in turn, allows for smoother and stress-free scrolling, web browsing, and other operations. With the pre-installed DiXiM Home Network Application, the phone can connect to DLNA-compliant Blue-ray disk recorders and other devices and view streams of recorded terrestrial digital broadcast programs(3). Data can be transmitted between PCs and the smartphone over a Wi-Fi network. With this functionality, users can send and receive office documents, in addition to photos and movies. Users can enter text using hand-written input by physically writing on top of the software keyboard (both numeric keypad(4) and QWERTY). Users do not have to switch input modes to enter numbers and emoticons, allowing for the intuitive and quick composition of sentences for greater convenience. By having the user listen to preset sound clips and select the one that is easiest to hear, the phone will determine the user's individual hearing needs and adjust the sound accordingly. Using an accelerometer and a microphone, this alarm clock system monitors users' body movements and breathing to determine how deeply they are sleeping. When sleep is detected to be at its lightest point, the alarm is activated, thus enabling users to start the day refreshed. The same One-Seg, Osaifu Keitai, infrared communications, and QR code functions users have become accustomed to in feature-type mobile phones are available in this easy-to-use smartphone. IS12F comes equipped with a full-featured multimedia dictionary that supports both audio and video files. The dictionary provides access to a total of 29 dictionaries(5), such as Kojien, English-Japanese Dictionary for the General Reader, Katei Igakukan, and dictionaries for three different foreign languages. The handset's maximum sensitivity equivalent of ISO 12800(6) enables bright photographs to be captured even at night, when indoors, or in other low-level light, while reducing subject blurring and graininess. With new support for the Bluetooth Dial-up Networking Profile, it is possible for IS12F to connect to car navigation communications services. Water resistance: Please ensure that the cap and battery covers are firmly closed. Users should refrain from immersion in seawater, pool water, and hot spring water. The IPX5 designation indicates that the mobile phone can normally function after being sprayed with water from a nozzle with a diameter of 6.3 mm at a rate of 12.5 liters per minute from a distance of approximately 3m for a period of at least 3 minutes. IPX8 designation indicates that the smartphone normally functions after being immersed in room-temperature tap water to a depth of 1.5 m for 30 minutes. Applies to digital terrestrial TV programs recorded and stored on DLNA servers using the DTCP-IP copyright protection technology. There is no guarantee of compatibility with all equipment supporting DLNA. Depending on the content, replaying content may not be possible. To view streaming digital terrestrial TV programs, an 11n wireless LAN connection is recommended. When entering text in mobile phone input mode. Some dictionary data must be downloaded from a PC using a microSD or SDHC card. Up to VGA (640 × 480) size. Applicable in areas that support maximum 9.2Mbps downlink (5.5Mbps uplink) speeds. The service employs the best-effort delivery method. Listed speeds are the maximum speeds attainable using the technical standard and do not reflect actual usage speeds. Speeds may significantly decrease depending on the communications environment, network traffic, and other factors. For a list of coverage areas, please see au's homepage.